If your restaurant plate is garnished with an herb, it’s probably parsley. This herb is widely used and prized not only for it’s added flavor, but also for it’s health benefits. Once you understand medicinal and nutritional parsley health benefits, you won’t only eat your garnish, you may want to grow your own! And growing parsley is easy! Parsley (Petroselnum crispum) is native to the Mediterranean region of the world. While its roots are in places like Southern Italy, Tunisia, and Algeria, it can now be found globally. Despite its current popularity, though, parsley has a somewhat dark past. Parsley wasn’t always so well-liked. As a matter of fact, the herb was known to strike people with fear. According to Dr. May Berenbaum, head of the University of Illinois Entomology Department, it was associated with death and the devil. The Greeks said the herb first grew in the blood of a fertility king, Archemorus (forerunner of death). As a result, it was laid on their tombs and when someone was said to “need only parsley”, it meant they were near death. The herb was so feared by the Greeks that an ancient Celt sent donkeys onto the battlefield adorned with parsley, and the Greek troops turned and fled. Virgins who planted the herb were said to risk impregnation by the devil himself. The only planting of parsley was done on Good Friday. Any other day meant the gardener would risk certain curse. But of course, this is just some of the foretold history. Fortunately, parsley’s relationship with fear disconnected over the centuries. Now, everyone has grown to love parsley. Parsley is of the family Apiaceae, along with carrots, celery, and other herbs like cumin, dill, lovage, angelica, and anise. It typically has longer stems and can grow to a few feet in height and diameter. The leaves are bright green and hairless. The herb contains valuable volatile oils and flavonoids. The volatile oil known as myristicin has chemoprotective benefits which means it can neutralize cancer causing agents and has been shown to prevent tumor growth. Flavanoids like apigenin and luteolin found in parsley act as antioxidants to protect cells from oxidative damage and stress. 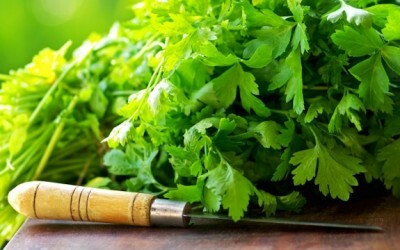 Parsley is also a great source of vitamin C and beta-carotene (pro-vitamin A). Some people put parsley on as high of a pedestal as kale in regards to health benefits. Just 1 tablespoon of parsley contains 61.5 micrograms of vitamin K (77% RDA), 5 milligrams of vitamin C (8% RDA), and 316 IUs of vitamin A (6% RDA). While you could wait until you get a little spring on your dinner plate, you’ll get far more benefits of this healing herb if you simply grow it yourself. Like basil (sweet basil and holy basil), mint, and oregano, growing parsley is relatively easy. All it needs is some water, sunlight, good soil, and tender-loving care. Parsley is best grown from seed (rather than a starter plant from the greenhouse). But, it has a notoriously slow germination period. Be patient, its coming. If you want a head start, soak your parsley seeds in a wet paper towel overnight before planting. Choose a sunny spot for the parsley, whether in the garden or a large pot. It can even be grown indoors if it has a bright, warm area. Just know that it may be “leggier” than an outdoor plant due to the dimmer conditions. Parsley likes the sun but can cope with a little shade too. It also prefers moist soil, so water generously. The seeds should be sowed about 1/8 to ¼ inch deep. When the plants are about 2 to 3 inches high, thin them so that they are 10 to 12 inches apart. Planting them apart ensures that they will have enough room to really flourish. Harvest your parsley by snipping it off close to the ground. Choose those stems that are on the outside of the plant. This will encourage a fuller, healthier plant. The best way to use parsley is when it’s fresh. It can be dried or frozen but loses much of its flavor that way. The easiest way to receive parsley health benefits is by simply eating it. This is especially true for digestive ailments or bad breath. Simply chew on a few sprigs of parsley and you should see quick benefits. Alternately, you can always make a tea, using 2 tablespoons of fresh parsley per 2 cups of water. Steep for several minutes before straining ,and enjoy. You can also add parsley to your foods for the nutritional perks. It makes a perfect addition to green smoothies too, upping their detoxification power. Parsley is just one of the many herbs you can grow at home in your yard or a sunroom. In addition to being a powerful healer, it’s a great culinary tool. very informative website .. love it!